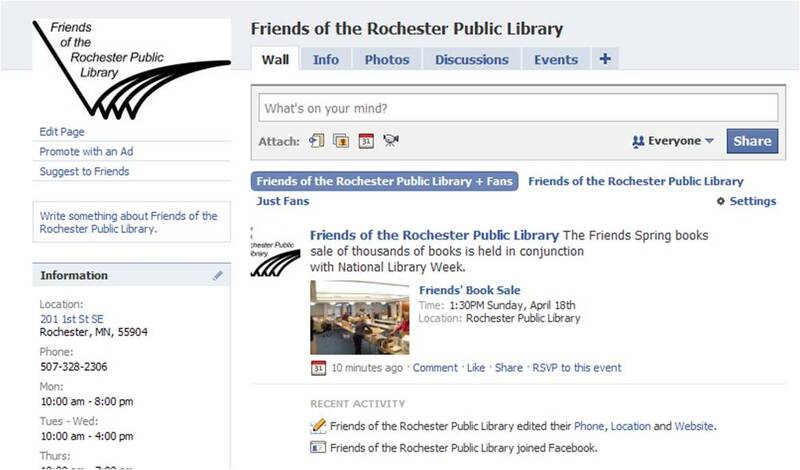 Fan us to learn about Friends’ activities, book sales, events and bookstore news. Today is a full moon! Therefore, in the Christian church, April 4th will be Easter Sunday, a day that celebrates Jesus’ resurrection. Easter is one of the few floating holidays in the calendar year, because it’s based on the cycles of the moon. Jesus was said to have risen from the dead on the first Sunday after the first full moon of spring (the vernal equinox of 20th March). For that reason, Easter can fall as early as March 22nd and as late as April 25th. The word “Easter” comes from an ancient pagan goddess (Eostre) worshiped by Anglo Saxons. In the legend, Eostre once saved a bird whose wings had frozen during winter by turning it into a rabbit. Because the rabbit had once been a bird, it could still lay eggs. Eggs were a symbol of fertility in part because they were scarce during the winter. There are records of people giving each other decorated eggs at Easter as far back as the 11th century. We didn’t get chocolate eggs until well after the new world was discovered! Our current holiday has easter bunnies, egg hunts, chocolate eggs, hats and other fun things for children of all ages. There are lots of books to read on this subject, and many others in our Bookstore! 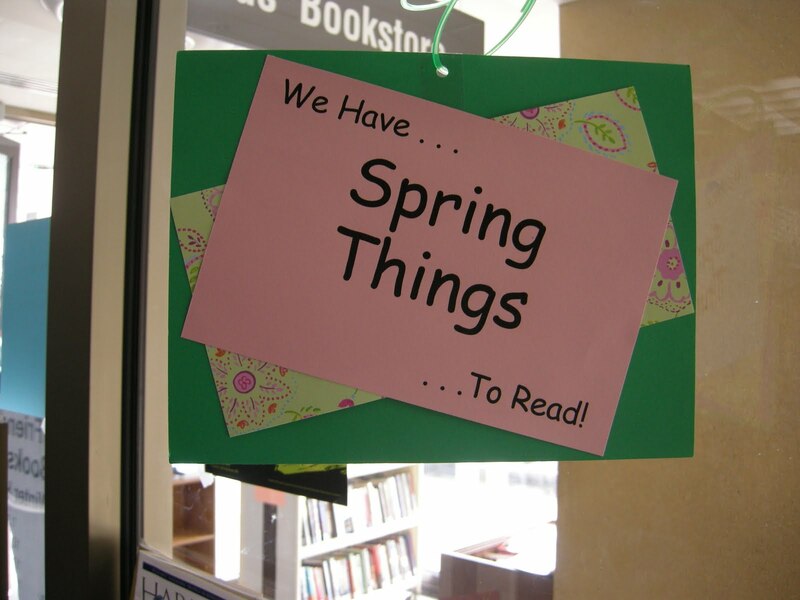 Just an advance notice that the Friends will be having a spring cleaning Book Sale on SUNDAY afternoon the 18th of April. 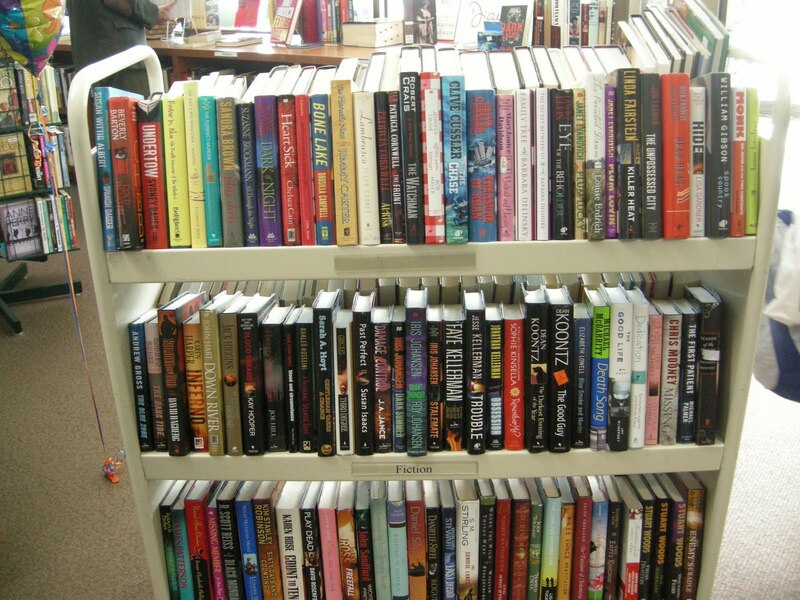 This is a great chance to find some great buys in fiction, non fiction, childrens and other media while we try to make space! Put it on your calendar now, and plan to be there early. 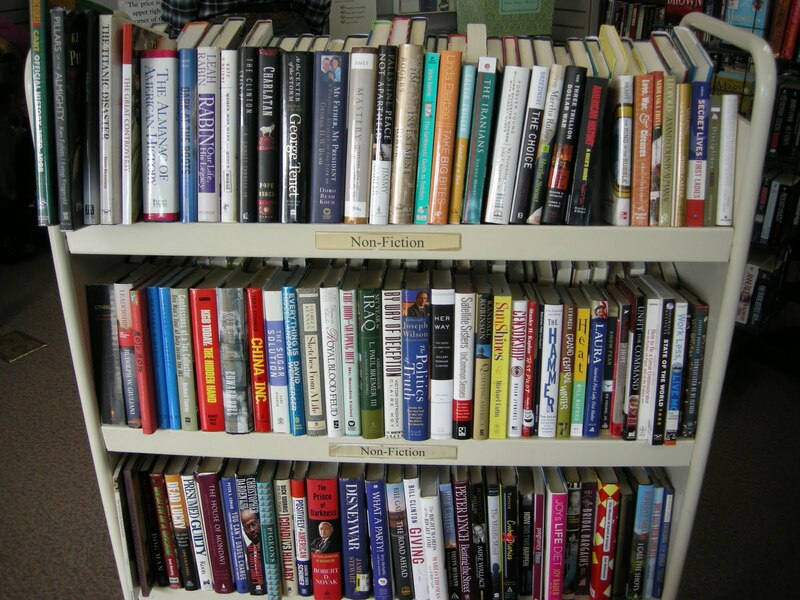 The Friends’ Bookstore will also have an excellent supply of newer used books available. I saw a wonderful sign advertising a Used Bookstore in Chicago this weekend: the name of the store was After Words. This past weekend I was visiting a friend and noticed that one of my favourite authors was being republished: Mary Stewart. I picked up the copy and rather quickly read through The Moonspinners, revisiting not just Greece, but the memories of the first time I read that book. Gothic suspense was the genre in those days (not too far from the first printing!) Her Merlin/King Arthur trilogy was sublime. I have been delighted by a number of other authors that have been republished, generally not widely read anymore. Gene Stratton Porter is a case in point. A few years ago Wisconsin started re-issuing her novels, much to my delight. All of my copies are in tatters, much loved and well read. There are many that I have never been able to find. I have mentioned how delighted I have been with Sandor Marai, Embers and Cassanova in Bolanzo, now being translated from Hungarian or German into English, 70 years after their original publications. Which is making a new book CITY SECRETS: Books a gem for me. There are essays, about many authors, noted for one book or one genre, in which unfamiliar and perhaps ‘best’ work is then described. I am familiar with 30 of the books (and do indeed think them masterpieces) so have at least 50 more to find. This was a great library book, and will continue my borrowing for some time to come. Unless I find it in the Friends’ Bookstore! 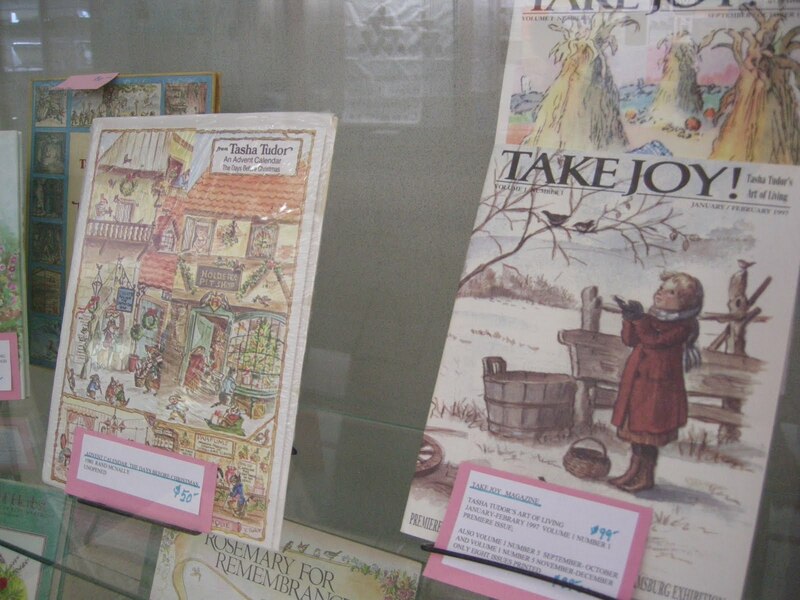 The Special and Unusual Books have a new display in our Display case located in the Library. Numerous books on and by Tasha Tudor are available for purchase! Check the Friends Website for further details. We have a great new display in the Friends’ Bookstore created for Spring by Sue McMillan. Did you know that by clicking on the photograph you can read all the titles? I tried this out and was delighted to more accurately share with you what is now in the Friends’ Bookstore! I will take photos often so if you can’t be there, check it out here. But I did get a lovely book, that I haven’t read! and can’t wait to read. Somehow it will be at least two days before I can pick it up but I will be sure to tell you all about it. Especially as the advance praise for the book includes the comment: “…belongs in what Gellhorn called the ‘permanent and necessary’ library.” The first chapter alone is beautifully written and makes me impatient to know the characters and the rest of the story! It is a perfect present that will give me hours of enjoyment.